March’s edition of What Your Therapists are Reading will not disappoint. We have topics covering Acceptance and Committment Therapy, transition to parenthood, tapping, authentic self and infidelity. Whenever I do this post I always find something else to read and learn. I have a never ending list of books to read and for some that may seem overwhelming, but I love it. In my area of the United States, March came in with a big snow storm, and I am dreaming of reading on the beach. I hope you find something to take away from this months What Your Therapists are Reading and find a nice cozy or warm place to read. 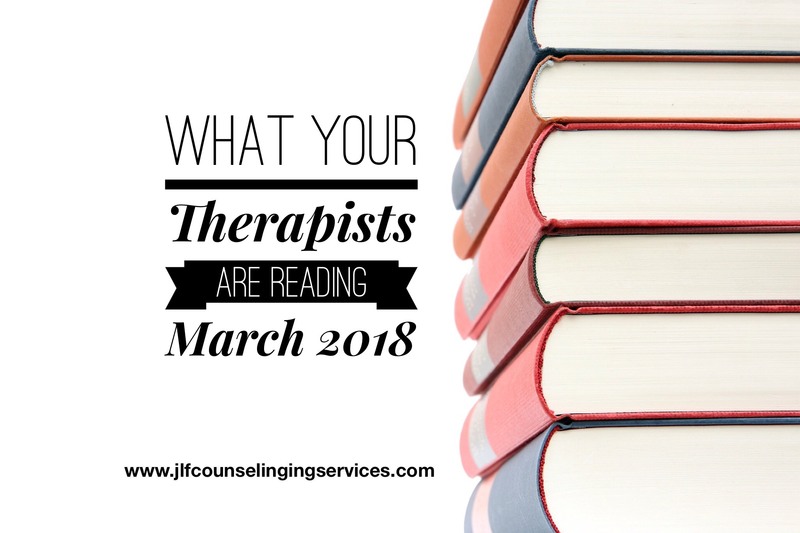 Thank you checking out March’s What Your Therapists are Reading. I hope you found something to add to your reading list. You can check out past posts from 2015, 2016, and February 2018 by clicking the links. If you are a mental health professional and would like to contribute, please contact me. As always, this post is for informational and educational purposes only. It is not an endorsement of those that contributed to the article or the books. If you are in need of assistance, please contact you local mental health center.